Samford University’s Center for Faith and Health partnered with Alacare Home Health and Hospice to host the annual Palliative Care Conference, a recent continuing education event. The conference spotlighted select aspects of end-of-life care through educational content and stories from actual cases, all to increase detailed awareness towards this critical arena of biopsychosocial-spiritual health care in light of our aging society, according to Paul Moon, manager of bereavement services for Birmingham-based Alacare. Throughout the day, experts spoke on topics of antibiotic use, caregiver stress and spiritual care as related to the end-of-life. 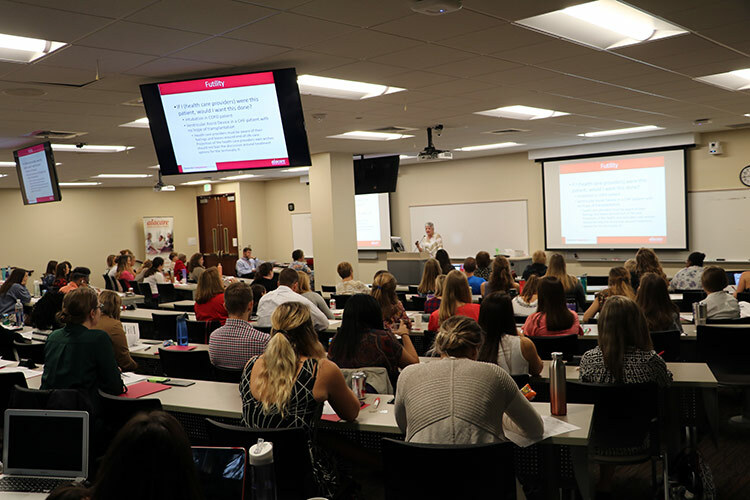 The conference concluded with an interprofessional panel consisting of a nurse, social worker, hospice chaplain and bereavement care worker who offered attendees—including Samford students—an inside look into their daily work. “The College of Health Sciences is grateful for our partnership with Alacare Home Health and Hospice to offer unique learning opportunities for our students and area health care professionals. Programs like the palliative care conference enhance the education of our students tremendously,” said Michael Hogue, associate dean of the Center for Faith and Health. The Center for Faith and Health’s next event is the Medical Missions and the Local Church conference, Sept 23. Speakers Danny Wood, senior pastor at Birmingham’s Shades Mountain Baptist Church; Larry Pepper, missionary to Tanzania; and Rebekah Naylor, award-winning surgeon and missionary, will speak on how to combine a calling to care with a passion for missions. Learn more at on the center’s website.